Between the ages of 8 and 13, kids want things they can show off to their friends. Here is where the fastest and more over-the-top RC cars are, where most kids between these ages will feel amazed by this type of toy. However, remember that these cars should also provide slightly more off-road operation and deliver a more resistant & reliable build. Kids these ages love taking chances and risking their toys, so you will see cars of all kinds but always the most resilient ones. Want to know more about them? Then come further and find out! These cars for big kids usually are harder to choose, mainly because kids start having a much more defined personality and they won’t like everything they see at first sight. So, we’ve decided to make a slightly more broad list of cars for you to find out the right one for your child. Everyone knows that a police car is cooler in many ways. Even more so, when it comes to being a muscle car like a Dodge Charger, if your kid knows what car it is, he will have a blast without a doubt. 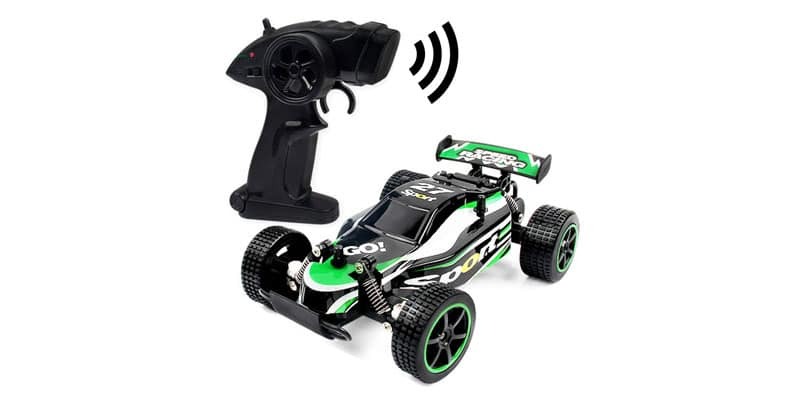 Easy to use as well with a 2.4 GHz radio control for up to 50m of control range – this car is not a simple toy. It charges fast as well with a mini USB charger and provides an exceptional driving time of up to 30 minutes straight. 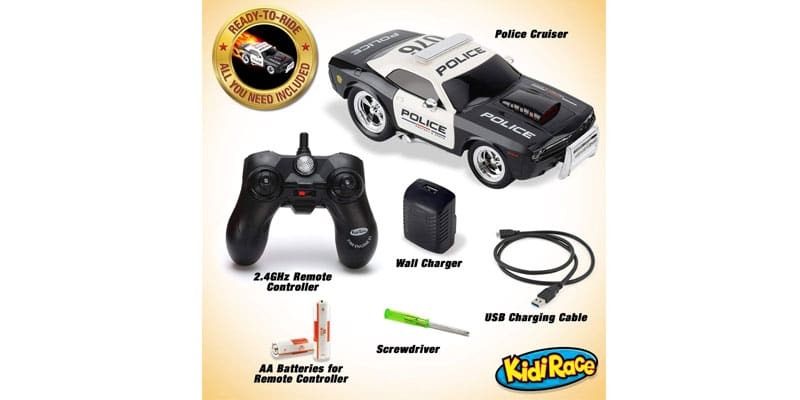 A stunt car is always an excellent choice for kids who like to experiment with their toys. The USA Toyz Cyclone is a magnificent choice not only because of that, but because it is incredibly fast and reliable as well. With its excellent design & build, kids can use it practically anywhere and enjoy a very entertaining ride. The car even enters in Cyclone or Off-Road mode, so it becomes either a stunt acrobat doing 360º spins and flips or else go over any obstacle in the most effortless way possible. 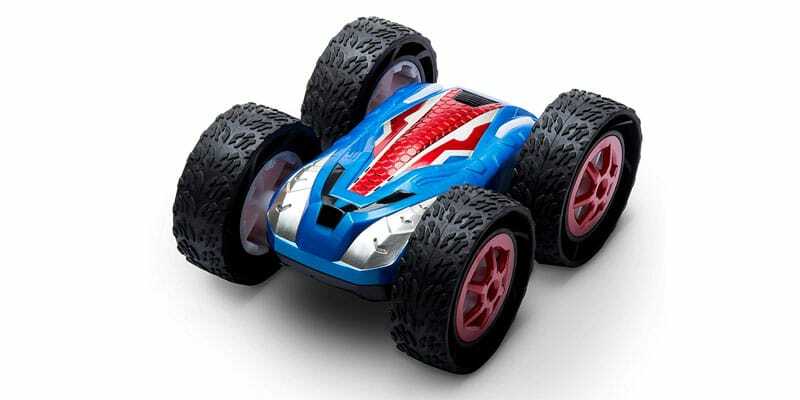 This is an RC car for the demanding kids who like outside environments. And surely, you won’t find one as reliable & versatile as this one. It also offers about 20 min of operation, so your kid can enjoy his time using it. The buggy from Blexy has almost everything your kid needs to have a blast with this car. For a very affordable cost, you can get a PVC-made car that resists virtually any environment with waterproof construction and exceptional speed. Capable of going up to 25 Km/h, this car is simply unmatched in the market. 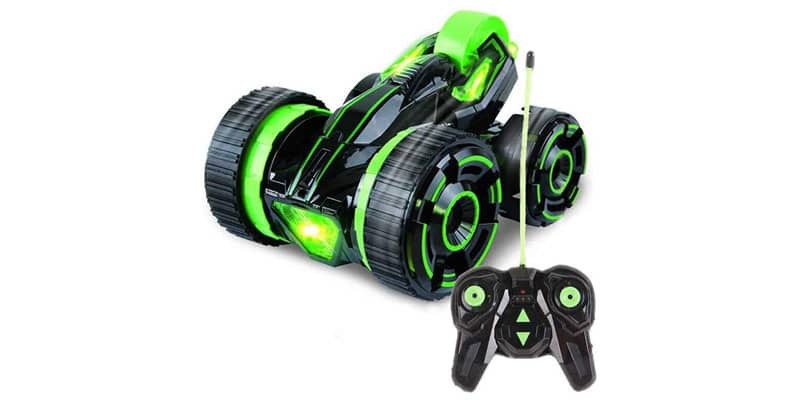 With its buggy design, it is also able to go over different types of obstacles effortlessly. And what’s even better, it offers up to 20 minutes of straight operation with only a full charge of 2 hours. The thing that makes it even more enticing for kids is the suspension. Coming with a very responsive & easy-to-use remote control, this buggy is also able to avoid shocks by absorbing them. So your kid can experiment as much as he wants and still get exceptional results. Boasting a design between a buggy and a monster truck, this Double-E Rock Crawler comes exceptionally enticing for kids between 10 and 13 years old. It is perfect principally because it is the right choice for kids who like a more off-road experience than with other cars. And of course, this car supports all that with a magnificent suspension system in its 4-wheel system. The controls are also entirely straightforward. Your kid won’t find anything too hard or complicated for his skills or knowledge. He will merely have to drive it, and that’s it. What sets this truck apart is the ability to be managed from up to 260 feet away, which is around 80 meters. 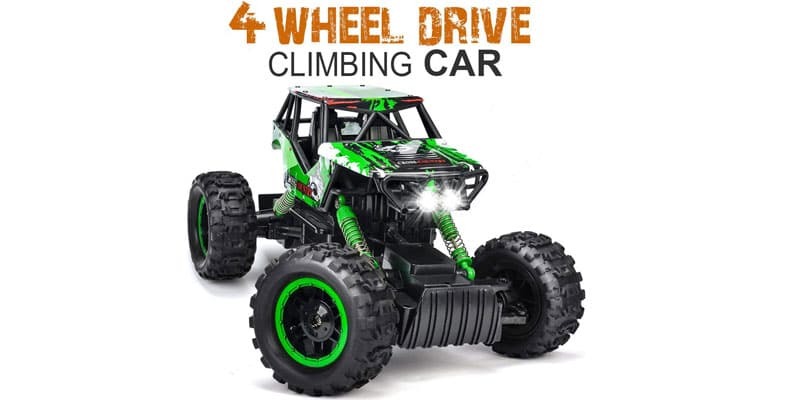 Add the overall high-quality construction and entertaining monster truck design, and you get one of the most reliable yet funniest RC cars in the market. Kids in the age range of 8 and 13 will always prefer a fast car than a cute one. The Ratoys high-speed Buggy is precisely that and more. It is capable of meeting 25 Km/h without problems and offering up to 15 minutes of straight operation at the fastest performance. 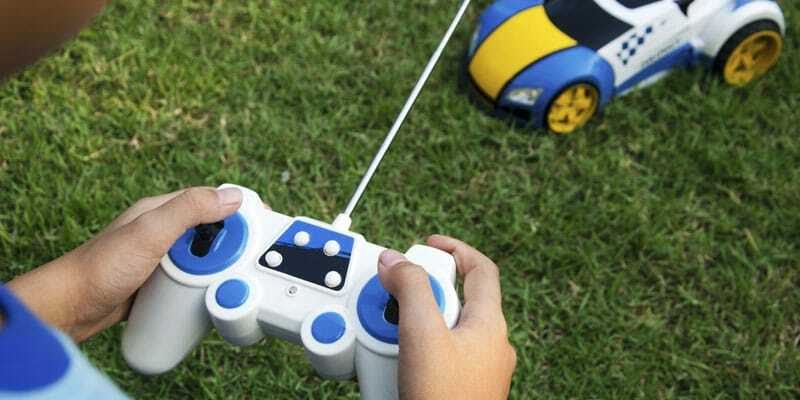 Your kid will just love it, even though it looks slightly dull, the buggy design is still thrilling enough to keep your kid interested in the car. Especially when you consider its suspension system, you can easily say this is more of a stunt buggy than a high-speed one, and those are only two of its excellent features. Add the exceptional 50m control performance and its reliable remote operation, and you get a top-notch choice for your kid. Although kids on this age range don’t like the shiniest or most colorful options, still enjoy when a car looks enticing enough for a wide array of kids. The SZJJX Five-Wheels is precisely that, an uncommon-looking design with an excellent set of additional features. 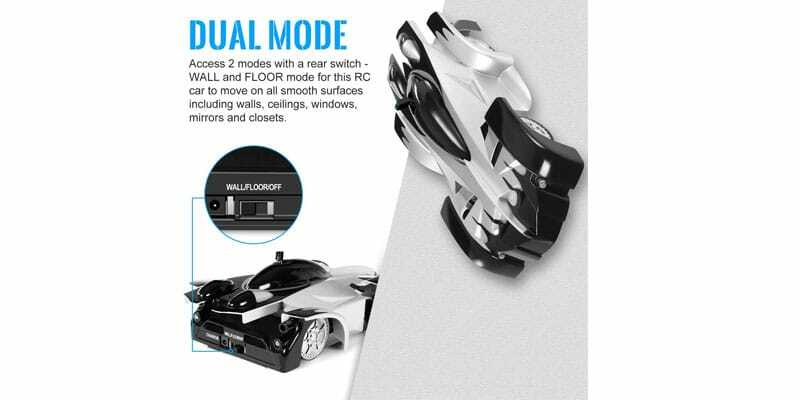 Being an exceptional stunt car with its fifth wheel on top, your kid will be able to perform a wide array of tricks without problems. The controls are entirely straightforward because of this, and due to its large & reliable wheels, the car even goes to off-road places without difficulties and is easy to control. Add the excellent set of headlights and shiny design, and you get a car that even kids of this age range won’t complain about having. Remember you are looking for a car that does what others do not. The Sgile is a perfect example of the car a kid between the ages of 8 and 13 will just love. It can be driven either on the floor or the walls. Admittedly, it won’t climb 5 meters up walls, but it will offer the chance to enjoy excellent stunts and different types of driving than other options. And for a fantastic price, you won’t believe how good this is for kids. The car also offers an impressive design that looks like a Batmobile but white. Add the lights and overall ease of use of the car, and you will find an exceptional choice entirely. However, it drains batteries fast. Not all big kids love the same things. Here, they start having different desires & likes than other kids and become different in almost every way. This means you have to be much pickier when choosing the right RC car. Luckily for you, we know exactly what to look for. Most kids in this age range want something that does not look too shiny or colorful, but instead, that looks cool or badass. We recommend going for monster trucks, cool buggies, or cars that imitate real-life models. Here, kids don’t have a preference between cars, buggies or trucks. But they will surely dislike anything that looks more like a toddler car than a big kid one. So, try to choose a more mature option to avoid complaints. Between 8 and 13, most kids are already capable enough to do a wide array of stuff with their hands and bodies. Their perceptions and sight capabilities are also way better and can learn things fast without problems. Here you shouldn’t focus on picking a professional-like control for your kid, but at least focus on a complicated one your child can feel tested with. This also leads to a more entertaining experience and keeps your kid from getting bored quickly. If there’s something your kid will look for is a further feature that he can boast about with his friends. 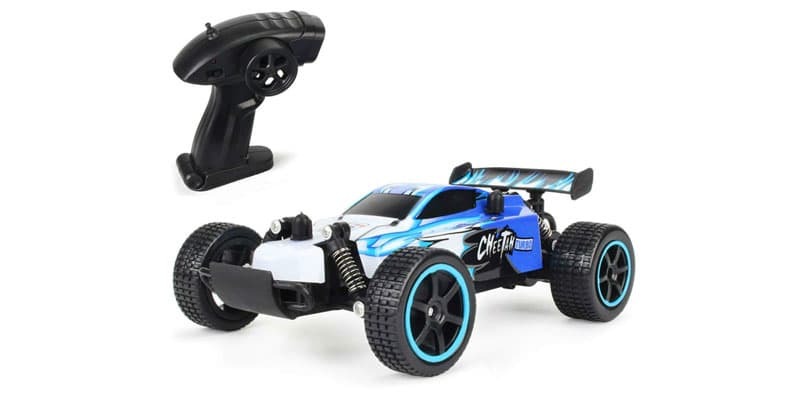 When picking the right RC car, take this part into account, whether it is a waterproof build, a more off-road feature, or a wall-climbing operation – it will undoubtedly be a great choice. Remember that in this age range kids start becoming more demanding, so your choice should also be of higher quality entirely. If you pick the right one, your kid will certainly appreciate it. But if you don’t, he will probably even hate it. So simply be more careful on what you pick and take our recommendations into account. You won’t be disappointed if you follow our advice!